Clive is still doing his Local Preacher training, he is ‘on note’ and this was an assessed service. The general theme of the sermon was God’s plan to involve people like us to build the Kingdom of God with each one of us using the gifts that God gives to serve the mission of God. 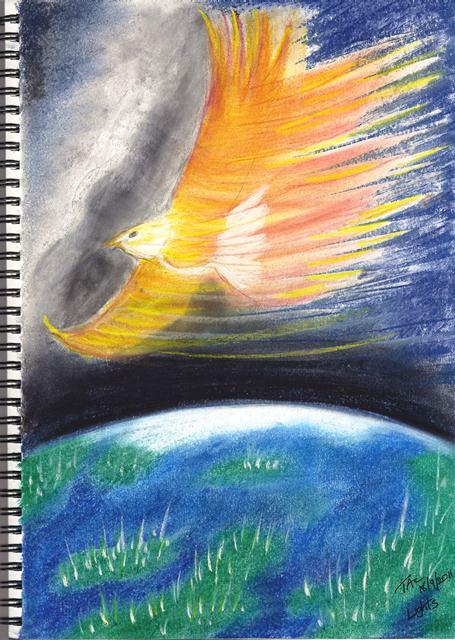 The eagle become a symbol of God’s Holy Spirit souring over the earth whilst on the earth there are pinpoints of light indicating the life and light of those who are following Christ. Inspiring to see the eagle and dove symbolism combined. Thanks Tim. Tim, thank you so much for your inspiration and gift of this picture. It was a privilege for me to have you, David and Dorothy assessing me at the Killinghall service on Sunday. Your feedback was encouraging and extremely motivational. And then to have this wonderful image to remind me of an important milestone in my journey as a preacher is simply amazing. I trust our paths will cross again soon. Every blessing, Clive.